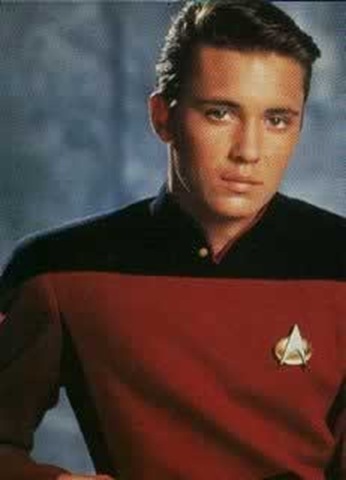 It has been once again brought to my attention that I am some sort of traitorous Trekkie for admitting that I had a crush on one Wesley Crusher when I was a kid. (Hehe, a crush on crusher. )(I’m such a nerd.) I had a friend in college who teased me endlessly about this (partially because he was truly horrified and partially because he never knew where the line between funny and just plain irritating was), and I never was able to fully explain it. It’s not like I still feel that way – the old I get the better Picard looks ;). I am taking this opportunity to defend myself once and for all, let the mockers do their worst. First of all, I would like to point out that ST:TNG started airing in 1987 when I was all of 5 years old. I didn’t actually start watching it until later, when I was 10 or 11 and re-runs would play every day. I have never seen the series in order and I’m not 100% I’ve seen all of the episodes… hmm, that may be my next Netflix project now that I’m about caught up on Dexter (verdict: awesome!) and How I Met Your Mother (verdict: cute). This is the age when I would set the VCR to record episodes because they were either on at 11am when I was at school or 11pm when I was in bed. Kids, these were the dark days before Bittorent and DVR, when we had to use the things called tapes that were the size of a book and had a tendency to get eaten by the machine called a VCR. I also had a younger brother who had an unfortunate tendency to push things that were not tapes into the tape slot, a large slice of cheddar and a matchbox car being two of the most memorable victims. So, as number 1 indicates, I was very young when I fell in love with this show, and as anyone would I needed a character to empathize with and who would be my gateway into the story. I think it was perfectly natural that that person would be Wesley since he was the only one present who was even remotely close to my age. I know all the reasons people had for hating him, and now that I’m older I am annoyed by a lot of the same things, but at the time I had a weakness for stories involving kids doing things that adults didn’t expect them to have the capability to handle. This theme carried over to my literature choices, and books like Island of the Blue Dolphins and My Side of the Mountain were read and re-read endlessly. It made sense for the adults on the show to have the capabilities they did, but Wesley was as special as I wanted to imagine myself to be, and I loved him for it. This reason is probably the most true: I have always been attracted to intelligence, even when other qualities are lacking. Case in point would be my ex-fiance. He was is an extremely talented and intelligent individual, but his emotional IQ was sorely lacking. (I don’t say is lacking because I haven’t spoken to him in over a year so who knows what strides he might have made meanwhile?) So I loved Wesley for the same reason I love Spock, Henry, McKay, Baltar, etc. They may be selfish, rude, annoying, or completely unemotional, but the brains just get me every time. So, is it so wrong for me to admit to liking Wesley? I don’t think so. Mock me if you must, but I will stand strong. For your amusement: Galacticast’s Starfleet Academy video.